Once upon a time, I was in the latter camp. I love mac & cheese. I love lobster. Putting the two together, seems like a great idea, but do I need both to be satisfied? Can't I just be happy with lobster? Or mac & cheese? And does the addition of lobster really add that much? And are they really going to add enough lobster to make it worth my while? Well, if it's lobster mac from Freeport Seafood Company in Freeport, Maine the answer is a resounding yes. 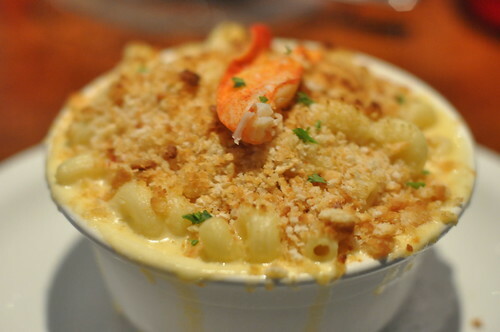 This five cheese mac was outstanding on it's own, creamy cheese sauce, spiraled elbows (ideal for cheese sauce retention) and it's positively loaded with lobster pieces, and not wimpy chopped body meat pieces, but real, meaty claw pieces. CLAW PIECES!!!! This claw on top is not just for show. There are claws--sweet wonderful claws inside. At $18 it's spendy, but worth every nickle. Freeport Seafood Company is the new kid in town, having just opened in May and I hope they stick around. They have a $9.99, whole lobster dinner special going with lobster plus fries and 'slaw. There are a lot of restaurants in Freeport that cater to non-discerning tourists ready to empty their wallets for a taste of Maine. You can get a real one here.